At Innovative, we strive to provide services that increase productivity. Very importantly, we’ve made enhancements to our search engine that are major steps in helping our customers work smarter, not harder. So without further ado, we’re thrilled to formally announce a major upgrade to our website search that now uses a world-leading search engine. Much of the secret sauce that makes a good search is under the hood, but what you will see is the search doing a better job of delivering relevant results. In addition, we’ve taken the opportunity to add some new features that make the searching experience easier and smarter. We’ll outline some of the new features below, and stay tuned, because we’re not done yet! One of the first things our new search does is attempt to predict what you are searching for, and present options that save you time and narrow your search to a relevant set of results. If you’ve ever used Google, you’ve seen this in action. We’re human, and sometimes we make mistakes! Well, now the search engine is a little smarter and will help make up for typos. Instead of returning no results because you typed “staplr” instead of “stapler”, the new search will try to figure out what you really meant. We’ve redesigned our product information page, as well as added over one million new relationships between products. You’ll see this when you click on an item to find out more. How does this help you? Well, in addition to a much cleaner view into the product and its specifications, you’ll also have quick access to products that go with the item, such as consumables, related products, other sizes, colors, and more. You’ll notice some new tabs on the product information tab. The example below showcases the Family tab. Now you can quickly see what other sizes or colors might be available to choose from. Much like if you opened a paper catalog and looked at a product page. With our new search engine in place and the new features we’ve rolled out, we hope you’ll find it easier to find the products you’re searching for. As always, we have more features in the works to continually improve the experience and help you be more productive. Stay tuned! Why do I have to select a ship to in order to shop for products online? I have so many ship to’s, it’s hard to find the one I need? Due to our new dynamic stock check feature, we had to move the ship to selection to the beginning of the ordering process. Instead of choosing your shipping location during checkout, you now must choose it upon login. Our new feature will tell you immediately upon clicking “Add to Cart” if the warehouse closest to your shipping location doesn’t have enough in stock to fill your order. To make this work, we need to know where the order will be shipping to. Quick Tip: If you’re logging into to do something other than place an order, just click any shipping address to proceed. If you order for multiple ship to’s there is an easier way to find the location you want to ship to than paging through them all. On the Right side of your screen there is a Filter Ship to’s box. Type in part of the location name, or part of the address and it will narrow down our options. In the example below I was able to narrow my options from 85 options down to 4. Quick Tip – to quickly access the last ship to used, you can click on the USE THIS SHIP TO button below the filter box and proceed with your order from there. 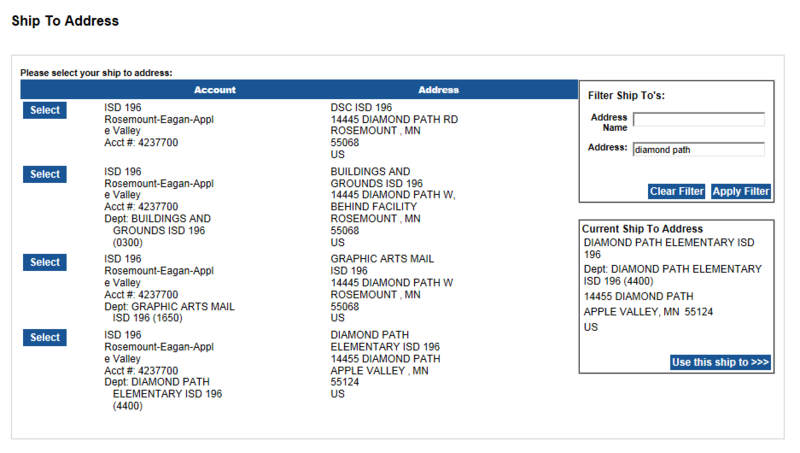 Proof of Delivery – now available online for local shipments! Ever wonder if your order is in the building? When was it received? Who signed for it? You can now find out online with our new POD (Proof of Delivery) feature! For any orders that were delivered by an Innovative uniformed driver, you will get complete information including date and time order was signed for as well as the name and signature of the person that signed for the order. Do you find yourself scrambling to find copies of invoices at the end of the month to reconcile your purchases? There has got to be an easier way than calling customer service, right? Well there is! Then, there are several ways you can search. You can select a date range, you can specify which Department (ship to location) you want to search or select All, or you can search by Invoice number, Order Number, PO Number, Billing Code or User ID. If you hover over the ID# you can choose to Request a Return or View Invoice Detail. 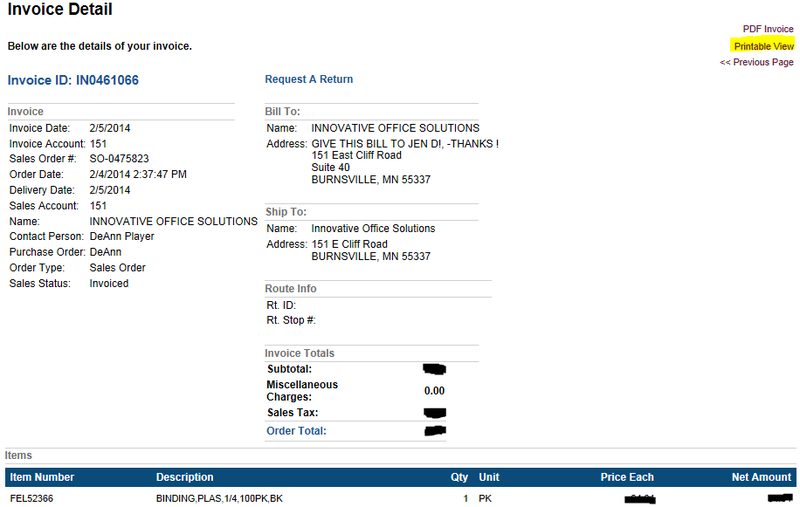 Click View Invoice Detail and you’ll be able to print a copy of your invoice. What if you knew an item was unavailable before placing your order? You’ve always had the ability to check stock on an item before ordering, but you had to click “Stock Check” to do so. Now we’ve integrated stock check into the “Add to Cart” button. When you add an item to your cart it will check the closest facilities to you and let you know if the item is unavailable for next day shipping. This allows you to select an alternate item before placing your order; and of course you can always contact Customer Service for assistance. Our goal with this new feature is to reduce back-orders and improve your experience. Knowing an item is unavailable will allow you to make another selection without having to wait and be notified after you place your order. We hope you find this new feature useful. Q: What is Dynamic Stock Check? A: Stock check has always been available, however it required you to manually click the “Stock Check” button to see if a product was available. We have now integrated stock check into “Add to Cart”. A: When you add an item to your cart, it will automatically check to make sure we have the requested quantity available in the warehouses closest to your shipping location. If there is enough for next day shipment, the item will be added to your cart as normal. If there is not enough for next day shipment, a popup box will be presented. Q: Why is this feature useful? A: While we make every effort to minimize backorders, with an online inventory of over 50,000 products, there is always the chance that an item will not be available. Our goal with this feature is to give you the information immediately up front so you can make a decision before placing your order; rather than waiting for us to notify you later that the item is currently unavailable in your location. Q: Why do I need to select my Shipping Address immediately after logging in now? A: In order to accurately check stock, we need to know where you are shipping your order so we can check the closest warehouse facilities to that location. If you only have one shipping address, you will not see this prompt. Q: What if I need help finding a different product? A: If the web site informs you that an item is unavailable currently, you can either continue shopping and select a different product that suits your needs, or you can contact our Customer Care team for assistance. Your Customer Care team can help you identify other options that are available for immediate shipment. Q: If an item is unavailable, can I still order it and wait? A: Yes. When you receive the popup that indicates the item is not available for next day shipping, you can still add the item to your cart. Our purchasing team will contact you with an ETA for the item, or recommend alternate products that are available for immediate shipment. Q: I selected my shipping address upon login, why am I being asked again during checkout? A: During checkout step one, the site will show your current shipping address and ask you to confirm it. At this point you can either change your shipping address, or click “Use this ship to” to proceed with the current one.